Why Choose Arkansas for Online Higher Education? By 2020, nearly 60% of Arkansas jobs should require applicants to possess some form of higher education. The Arkansas Department of Workforce Services supports these projections in its latest research: half of the state’s fastest-growing jobs require a college education. Affordable online programs in Arkansas help both in-state and out-of-state students obtain these careers due to programs’ accessibility, flexibility, and affordability. 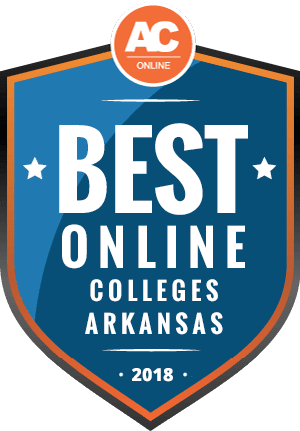 Continue reading to learn more about the most affordable online colleges in Arkansas, as well as tuition, school calendars, and financial aid. If you still have questions about the best online programs in Arkansas after reading this article, contact online programs directly to learn more. In 2016, Arkansas colleges and universities offered 48 online degrees, attracting nearly 15,000 undergraduate and graduate students, 82 of which were international. Many factors draw U.S. students to online learning. Previously underserved groups — such as full-time professionals, single parents, and laid-off workers — benefit from online education. Likewise, international students earn degrees online to avoid travel and housing costs associated with living abroad. Arkansas residents who earn a bachelor’s online spend approximately 60% less than out-of-state students who attend the same public colleges and universities. For associate programs, in-state students save 25% on tuition compared to out-of-state students. To qualify for in-state tuition, new residents must live in Arkansas for six months; Arkansas boasts one of the shortest residency requirements in the United States. Some Arkansas colleges and universities participate in the Academic Common Market (ACM), a consortium of schools in 16 southern states. Depending on the ACM state where you live and your intended major, you may qualify for in-state tuition at an online college in Arkansas. Compared to online programs in other states, Arkansas boasts competitive tuition rates that can save you thousands of dollars on your degree. In 2016, just over 3,000 out-of-state students earned their degrees online in Arkansas. Out of this group, graduate students outnumbered undergraduate students by a 5-to-1 ratio. In this section, you can learn more about how out-of-state students may benefit from tuition reciprocity agreements and university-specific policies that attract talented out-of-state students. As always, research specific colleges and universities to learn more about tuition and financial aid policies that can impact tuition costs. Arkansas holds membership in the Southern Regional Education Board, which uses the ACM to reduce tuition costs for college students living in its 16 member states. Eligible out-of-state students pay in-state tuition. Prospective students should keep in mind that some colleges and universities participate in the ACM only at the graduate level, meaning out-of-state undergraduate students pay out-of-state tuition in all circumstances. Aside from regional agreements, the University of Arkansas offers a non-resident tuition award for eligible transfer students living in the six states that border Arkansas. As you research other public schools, determine if they use similar scholarships or programs to attract out-of-state applicants. All states besides California cooperate in the National Council for State Authorization Reciprocity Agreements (NC-SARA). Within these states, participating colleges and universities work together to streamline their distance education requirements. Similar requirements help online students transfer credits between institutions in different states. Visit the NC-SARA website for Arkansas for a complete list of Arkansas NC-SARA schools. The site includes links to each school so you can quickly determine which schools offer online programs that match your interests. You can research Arkansas’s top affordable online colleges in this section. Rankers choose schools that offer excellent programs at affordable prices; each program features at least three online programs and charges out-of-state students no more than $25,000 per year in tuition. Rankers also analyzed schools’ student-to-teacher ratios, graduation rates, and career counseling services. Each school description includes a direct link to its online programs. This section offers answers to common questions regarding inexpensive online universities in Arkansas. For further questions, contact programs directly. Do online credits cost more or less in Arkansas? Earning an online degree in Arkansas can potentially save you thousands of dollars on your education. Prospective students hoping to save the money should focus on public colleges and universities. Out-of-state students should first determine if their home states’ public schools offer better in-state tuition rates than what they would pay as out-of-state students at an Arkansas public school. The average online tuition for private Arkansas schools often mirrors that of other states. Although many schools allow students to study part time and pay for courses individually, studying full time yields the most significant financial benefits. At many schools, full-time students pay a set tuition rate that allows them to take additional courses at no extra cost. You should carefully consider programs where full-time students enjoy this advantage. Which Arkansas schools accept the most transfer credits? Each school in Arkansas sets its own transfer credit policies. Public colleges and universities may transfer your associate degree credits to a bachelor’s program, especially if you earned your associate at an Arkansas community college. Not only does earning an associate degree before applying to a bachelor’s program increase your transfer credits, but this strategy may also save you money on your degree. Two-year programs cost significantly less than four-year programs. As mentioned earlier, in-state students at a two-year public college can save nearly 90% on per-credit tuition compared to students at a four-year private university. Out-of-state students save upwards of 80% on their tuition bills for their first two years of college if they follow this same strategy. Regardless of which school you plan to transfer to, maximizing your transfer credits starts with earning good grades. For example, at the University of Arkansas, students must earn a C grade or higher in all courses in which they hope to receive transfer credit. Also, for credits to apply, students must earn them at regionally accredited colleges or universities. The University of Arkansas does make some exceptions to these rules; other schools may not have such generous policies. Will any online colleges in Arkansas accept a GED? Most online colleges in Arkansas accept the GED. The University of Arkansas, the state’s premier public university, accepts GED applicants as long as they complete 16 specific year-long high school courses. Applicants who do not meet this requirement may still apply as long as they complete these courses during their freshman year. Southern Arkansas University uses slightly different admissions standards; applicants may possess GEDs, but only receive conditional admission if they score below a 19 on the ACT. To gain unconditional admission at Southern Arkansas University or other institutions with similar policies, students should study for and take the ACT before applying. Private colleges may have more stringent application requirements. One of the most highly-rated private universities in Arkansas, Ouachita Baptist University requires that applicants possess high school diplomas. How many academic terms per year do online colleges in Arkansas offer? At the University of Arkansas, students can start earning their degrees online during the fall, spring, or summer semesters. Harding University, a private school, uses the same start dates. The best online programs in Arkansas do not offer start dates every week or month. If the program you select employs three start dates throughout the year; however, you should not have to wait for more than four months to begin your education. Use this time to prepare: take any required standardized tests, buy necessary computer hardware and software, and refine your academic focus. You can also use the weeks or months before school to adjust your personal and professional schedules to work around your studies; many students struggle with juggling school, work, and family in the weeks after starting an online program. Preparing now can reduce your future stress and increase your odds of academic success. Finally, before starting school, you can explore free online learning options open to people living all over the world. In a later section, this article explains free online learning courses in greater detail. Which online colleges will accept FAFSA in Arkansas? Affordable online schools in Arkansas use the FAFSA to award need-based financial aid to incoming students. Before applying, ensure that schools on your shortlist accept the FAFSA. The FAFSA website allows you to search for member colleges and universities. Those that possess a Federal School Code accept FAFSA results. Submit FAFSA results as soon as possible to schools to which you plan to apply. The sooner schools can access your information, the sooner they can calculate your financial aid award. Even if your college accepts FAFSA results, you may still need to submit other information to the financial aid office. Some schools require additional information to award school-based financial aid. As policies differ across higher education, contact individual schools to learn more about financial aid for online and out-of-state students. Performing research now can prevent you from missing out on valuable scholarships, grants, or loans. Are there any free online classes I can take from Arkansas colleges? Unfortunately, as of the writing of this article, no colleges or universities in Arkansas offer free online classes, such as massive open online courses (MOOCs). One reason that free online courses may not exist in Arkansas involves NC-SARA. When MOOCs first appeared, states grappled with whether MOOCs fell under NC-SARA regulations. States did not know if MOOC credits would transfer between schools in two states. NC-SARA has yet to resolve this issue, meaning that some states like Arkansas do not provide free online courses. Despite Arkansas colleges and universities not offering MOOCs, you can still take free online courses at institutions in other states, the credit from which may transfer to an accredited online university in Arkansas. To find out which schools might accept MOOC credits, contact their admissions departments for more information. Although the state’s colleges and universities do not offer free online courses, Arkansas boasts a unique program that grants residents aged 60 and over free tuition at all public colleges and universities. This guarantee extends to online courses and programs. Though restrictions apply, senior citizens can expand their educational horizons, stay active in retirement, or prepare for a second career that more closely aligns with their interests. How can I find the online program options at Arkansas colleges? Unlike other states, Arkansas does not have a centralized website detailing all online program options at the state’s colleges and universities. However, some universities, such as the University of Arkansas, boast easy-to-use online resources that explain online learning. For both in-state and out-of-state prospective students, these university websites include valuable information about degree options, the online learning experience, and tuition. Also, admission counselors may provide additional information that applies to low-cost online degrees in Arkansas. As you review college and university websites, make a shortlist of those that best match your academic interests and career goals. Doing so will allow you to turn dozens of potential programs into a manageable few. Your FAFSA results may qualify you for a Pell Grant, which the government awards to students with financial need, typically those who earn fewer than $20,000 per year, but students who earn up to $45,000 per year may still qualify. If you do not receive a Pell Grant, start your scholarship and grant search through the list below. Some scholarships on this list only accept applications from Arkansas college students. Arkansas single parents enrolled at a two- or four-year college or university may apply. Other scholarship requirements include a minimum 2.0 high school GPA, eligibility for need-based aid, and U.S. citizenship or permanent residency. Application materials and deadlines vary by county. The Cornerstone Scholarship Charitable Trust awards college scholarships to disadvantaged African-American students living in Arkansas. Other application requirements include transcripts, essays, and proof of citizenship or permanent residency. Submit all application materials by June 30. The scholarship committee considers both academic achievement and financial need. The NAJA Scholarship awards funding to graduate students planning to work with children. The NAJA website lists approved majors, which include psychology, special education, and counseling. Submit all application materials by the February 1st deadline. Scholarship recipients can apply for the scholarship more than once. High school seniors living throughout the United States can apply. Arkansas residents apply for the Region III award, which considers applicants from 13 other states. Applicants submit official high school transcripts, essay, ACT or SAT scores, and up to five recommendation letters. The NIADA scholarship committee solely considers applicants’ academic merit when making scholarship determinations. SAWF awards this scholarship to women high school seniors and undergraduates studying in STEM fields related to the automotive industry. Scholarship recipients can apply the award to a bachelor’s, master’s, or doctoral degree. Submit all application materials by the Dec. 1 deadline. SAWF announces scholarship recipients in the summer.